WASHINGTON (CNS) — The general counsel for the U.S. Conference of Catholic Bishops filed an amicus brief with the U.S. Supreme Court in support of the Little Sisters of the Poor, who have asked the court for relief from being forced to comply with the federal contraceptive mandate. The brief was filed Jan. 8 in the Zubik v. Burwell case, which the court will hear this year. The case will determine whether the Little Sisters of the Poor and other ministries can be forced to comply with the contraceptive mandate of the U.S. Department of Health and Human Services. The Little Sisters of the Poor and other organizations that sued say that the acts of filling out the form or notifying HHS are a substantial burden on their religious rights because the steps implicate them in the ultimate provision of contraceptives. The 10th U.S. Circuit Court of Appeals disagreed in a July 14 ruling, saying the sisters were not substantially burdened by procedures set out by the federal government by which they could avoid the requirement to provide contraceptive coverage in employee health insurance. The USCCB brief argues that the contraceptive mandate not only damages religious freedom, but society as a whole. “If the petitioners abide by their religious beliefs, they face the loss of the ability to sponsor health coverage for their employees and millions of dollars in fines, threatening financial ruin. No one benefits from such an outcome — not the organizations, their donors, their clients, or their employees,” the brief said. The brief also highlighted the major contributions made by Catholic and other religious charities and social services by assisting millions of people every year. Seven other Catholic and non-Catholic organizations signed onto the USCCB brief: Association of Catholic Colleges and Universities; Catholic Relief Services; Family Research Council; Institutional Religious Freedom Alliance; The Cardinal Newman Society; Thomas More Society; and World Vision. Other amicus briefs were filed by leaders from other faiths and members of Congress. “Our brief argues that the government’s mandate and its subsequent ‘accommodation’ scheme seek to coerce EWTN and other religious organizations into violating our strongly held beliefs. The Supreme Court needs to find the mandate to be unconstitutional,” Warsaw said in a statement. “We have great admiration for the Little Sisters who are standing up not just for themselves and the elderly poor they serve, but for the rights of all people of faith, including Jews,” said Rabbi Mitchell Rocklin in a statement. “Their courage is an example to all of us,” added the rabbi, a member of the executive committee of the Rabbinical Council of America. “We have been serving the elderly poor for over 175 years and are simply asking the government to allow us to continue our life’s work without being forced to choose between our faith and millions in government fines,” she said in a statement. 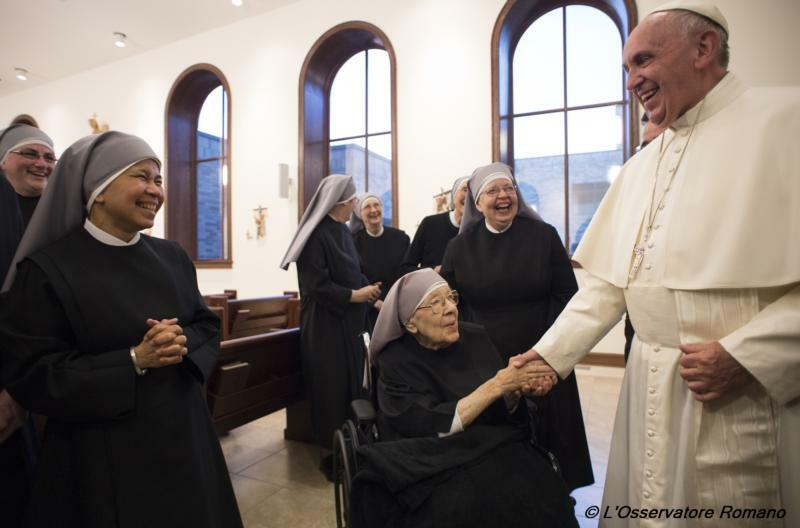 Sister Loraine Marie and Sister Constance Carolyn Veit, director of communications for the Little Sisters of the Poor, have been invited by House Speaker Paul D. Ryan, R-Wisconsin, to attend President Barack Obama’s State of the Union address Jan. 12.